Eye-Fi Launches Their New Mobile X2 Card, Direct Mode And Mobile Apps Soon To Follow | OhGizmo! By Andrew Liszewski on 04/12/11 • Leave a comment! The world’s most feature-packed SD memory card just got a bit more capable today as Eye-Fi has officially launched their Mobile X2 version featuring their new ‘Direct Mode’. The new mode, which was first shown off at CES earlier this year, lets the Eye-Fi card connect directly to an Android or iOS mobile device by creating its own wi-fi network, so the card and your smartphone/tablet can communicate even if you’re out in the middle of nowhere. Direct Mode will also be available for the company’s existing Eye-Fi X2 cards via a firmware update available sometime next week, though users excited to try it out will still have to wait for the accompanying iOS and Android apps to hit their respective app stores. The new mode is pretty exciting though, as it lets users almost instantly see their shots on a larger display if they’re using it tethered to a tablet, and if the device happens to be equipped with 3G mobile data, the shots can then be automatically sent to an online gallery. 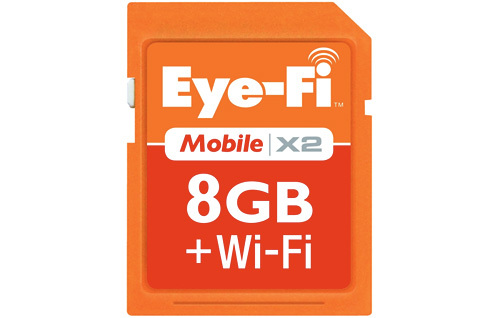 The new Eye-Fi Mobile X2 card which features 8GB of storage and the Direct Mode functionality already built-in will be available starting April 17 for $79.99.